Join the 2018 Friends of Faire! Can’t get enough of the Bristol Renaissance Faire? Are you a true blue Faire fan? Indulge that urge and take your involvement beyond the status of Patron to an official “Friend of the Faire”. Membership is open to anyone and includes one-time visitors as well as season ticket holders, patrons, merchants, and performers alike. An honored division of Renaissance Entertainment Productions’ national Friends of Faire organization, the Bristol FOF group offers 2 levels of membership which include a variety of benefits ranging from deeply discounted tickets, a private on-site garden and your own privies – just to name a few! Not sure if you want to join? 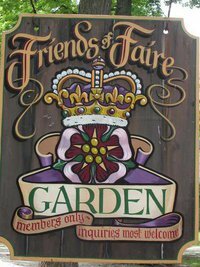 Purchase a Day Pass (available ONLY at the Friends of Faire Garden) and learn first-hand what being a member is all about! Limit 1 day pass per person per season. A Friends of Faire Membership does not grant you admission to the park. You will need tickets or a Season Pass to get in to the Faire itself.